The three bedroom brick home. Three bedroom three bath brick ranch. There is a full mostly finished basement with an extra bath and bedroom. There is also a family room, recreation room, and laundry room. Home is heated by heat pump and cooled by central air. There is a small storage building and a large metal building with electricity and a half bath. There is a nice single wide on the property with a second septic system. There are approximately 20.37 acres of woods and 3.66 cleared acres. The large brick ranch home. There is a great view of Bull Mountain from the front porch. A look at Bull Mountain from the front yard. The large garage has an office and bath. There is also a moble home on the property. There is enough land for a horse or two. Another look at the cleared land. 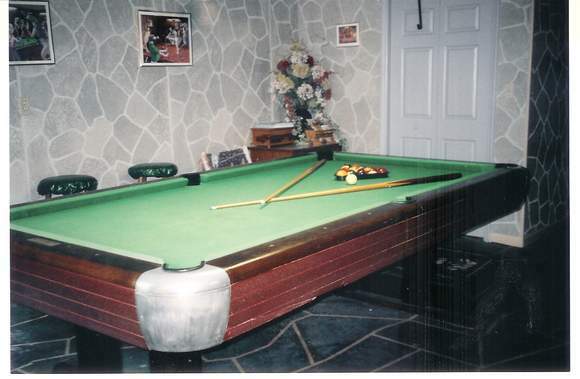 90% Finished basement with Den- Antique Billard Table remains on property.